Jonathan & Amy: Drive-In Movies!! 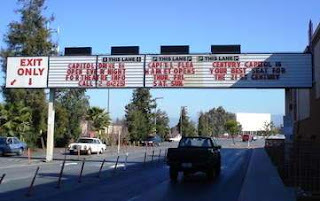 I was born in New Jersey, home of the original Drive-in Theater. 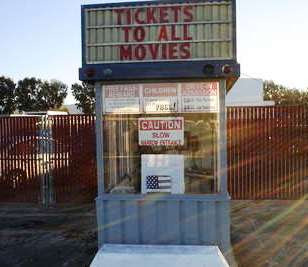 But, having grown up in Florida, going to "the drive-in" is pretty hard to do. There are less than five drive-ins in the whole state, and that was three or four years ago, there may be less now (edit: the internet seems to believe there are six in FL). So, three weeks ago when we found out there was a drive-in less than half an hour away, we knew we'd have to make the trip. 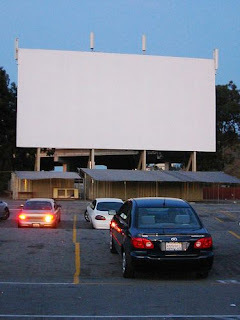 My only knowledge and understanding of a drive-in was what is seen in movies and on television (think Grease, the Full House episode with DJ and Viper, Flintstones, Rugrats), so I didn't quite know what to expect (neither did JB). For those who haven't been in recent years (or who have never been), it's nothing like what's pictured. The one in San Jose is behind a regular cineplex, and is a HUGE open space. Entering is like going to Disney... there's an entrance, you follow a bunch of other cars, and get funneled through one of four ticket windows. You pay, and the teller lets you know what radio frequency to turn to based on the movie you tell him/her. You can also buy candy there (popcorn, nachos, drinks, etc. are at a separate concession stand). Then, you drive onward and through a bit of a maze (especially in the dark) to find a good spot facing the screen you want. At this place, there are six screens in a half-circle format. You can park any-which-way since there's no box to put on your window. The center screen is the biggest, and all start a movie at 7:35. This is where it gets tricky. Jonathan wanted to see Watchmen and I did not. Luckily, I was able to angle myself so I could watch Madea Goes to Jail and he could still concentrate on his movie. Being clever, I brought along my Zune, and just set that to the frequency needed for my movie, while JB used the car's radio for his. Mine ended about an hour before his, so I turned my body and watched Confessions of a Shopaholic, which Jonathan also watched after his movie ended. See, you get to see a double feature for the price! The first round start at 7:30, but the second round start when the first individual movies end. THEN, after the second round, the first movies all start over again. So you can catch a 7:30 and 9:30 show, or 9:30 and 11:30 show (give or take). Thoughts on the movies: Watchmen didn't really make the cut. Madea is definitely not my favorite Tyler Perry film. I really wasn't planning on Confessions being any good, so it served its purpose as being a light-hearted comedy. I got really mad at a few characters, but otherwise all was well. Other thoughts: I LOOOOOOVED the experience. JB felt it was okay, he didn't particularly care for how far away the screens were (although if we had arrived earlier, we could have parked way closer). The nachos were okay, but the cheese-in-a-yogurt-container grossed me out. I think we should watch all movies this way from now on, LoL.